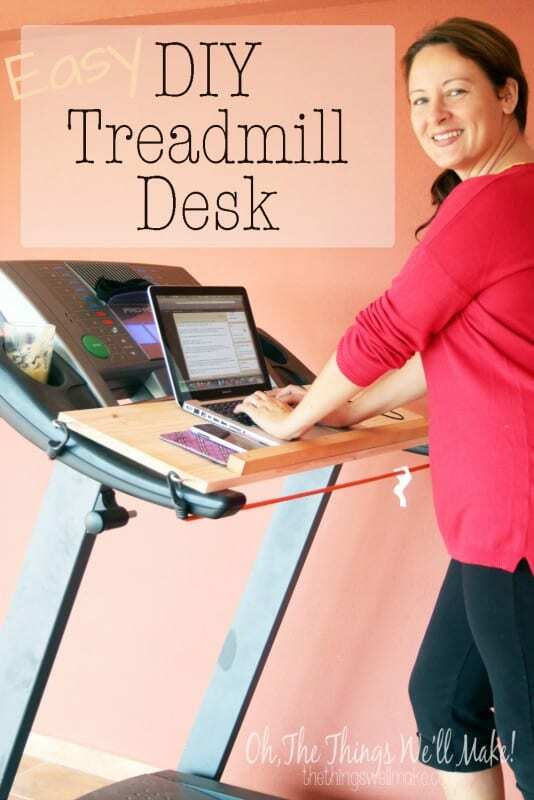 Easy DIY Treadmill Desk - Oh, The Things We'll Make! It has been ages since I've wanted to make myself a treadmill desk. 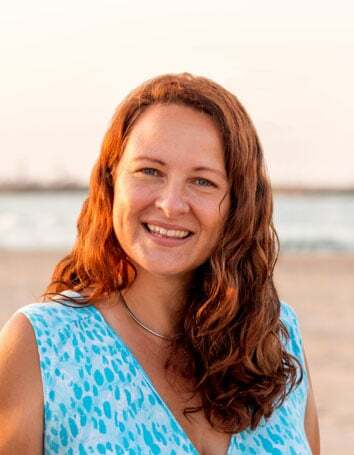 Despite writing a blog about what I considered to be a healthy way of eating and living, I didn't really feel like I was living it myself. Most people who don't blog don't realize the amount of time that goes into blogging. It isn't just about making a few recipes, taking pictures, and showing them to your friends. It can be, and may start out that way, but it usually progresses into something so much more! So, you learn to network with other bloggers in your field, and about promoting your posts on social media. All of that seems to take up more time than the actual blogging does! So, you are writing about wanting to be healthy, and end up stuck sitting down in front of a computer for hours on end, almost every day. Doesn't sound so healthy, does it? Despite my efforts at cutting out sugar and the foods that were aggravating my eczema problems, I just didn't feel as well as well as I wanted to. Plus, I put on weight. It's frustrating. You feel like you are eating healthier than you ever have, but feel like something is still missing. For me, it was some fresh air, and a bit of exercise. Don't get me wrong, I was doing the occasional exercise video, and still love hiking on the mountain, but I just wasn't getting it in every day, and even when I was, I was still sitting down for way too long. So, I finally did what I've been wanting to do for some time now, and I made myself a treadmill desk! Once I had all of my materials together, it literally took me less than 20 minutes to finish my project. I had looked up ideas online over a year ago, and already had my mind set on making a desk this way after seeing a similar desk on several blogs. I wish I could take credit for having come up with this wonderful idea myself, and I'd love to be able to send credit to the person who came up with the original idea, but, after seeing the idea on several blogs, I don't really know who that is. Before finding those blogs, my idea was similar, but I had planed to tie my desk in place. Using the bungee cords, though, is really a genius idea to make the desk easily removable. Why, o why, didn't I do this sooner?!?!? To be honest, though, I wasn't sure that I would even be coordinated enough to use the desk… You mean I have to think, write, and walk all at the same time!??!?! But, you know what? It all feels very natural to me, and I feel so much better when I'm writing while walking on my treadmill. I think I even concentrate more, and have an easier time thinking and writing what I want to say. When I'm sitting on the couch, inside the house, I get so easily distracted by other things, and end up not writing as much as I want to. I've only been using my new desk for about a week now, but I already feel like it's life changing! I'm serious! 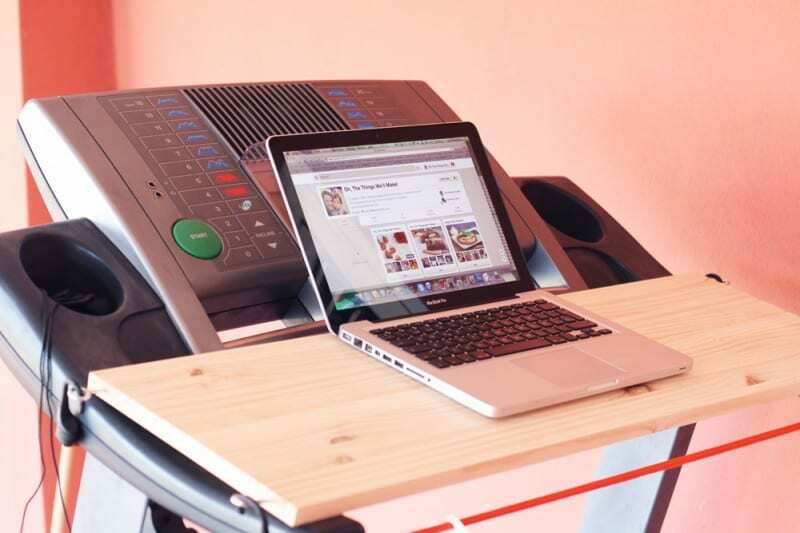 So, do you want to make an easy DIY treadmill desk too? I'll show you how I made mine. 1. 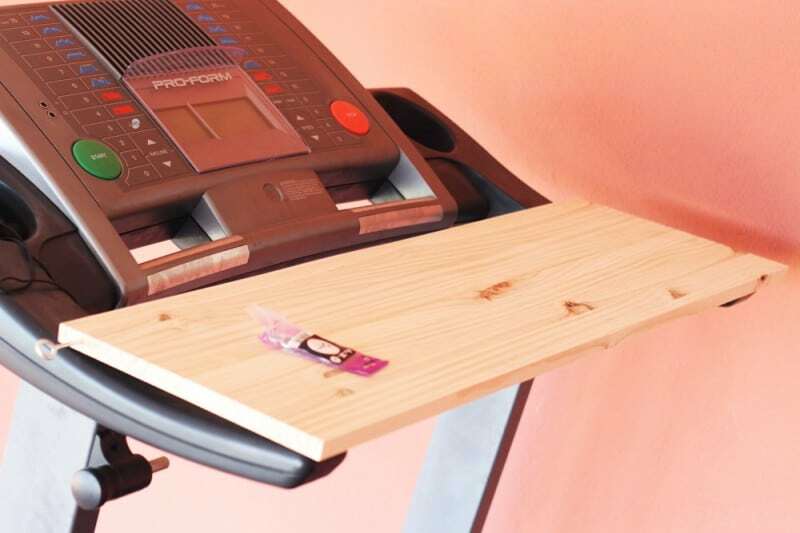 Measure the width of the armrests of your particular treadmill. I measured from the outside edges, and mine is 92cm across. 2. Next, measure the depth that you want your desk to be. I wanted mine to be just deep enough to comfortably hold my computer, and decided on an even 30cm. 3. Find a wooden board in the measurements you want your desk to be. I went to the hardware store and had them cut me a pine board into a 92cm x 30 cm rectangle. While I was there, I bought a package of 4 eye hooks, and some bungee cords. 4. When I got home, I screwed two eye hooks on either side of my desk-to-be (One at the top, and one at the bottom). 5. My desk was pretty much done! To put it all together, I took the two bungee cords, in the size that worked the best for the size of my treadmill, and hooked them from one side to the other, underneath the handrails. The first day I used my treadmill desk just like that. It worked well, but I decided that I wanted to add an extra ledge to keep my computer from falling, just in case. My computer stayed up pretty well without it, but I couldn't keep my phone next to it, in case someone called. The ledge works perfectly for keeping everything in place. How did I add it? I just found a small wood strip that we had around the house, and screwed it in place at the bottom of my desk. Easy Peasy! Now, I can easily remove the desk part whenever I want to run or fold up the treadmill for storage, and it's just as easy to put it in place again! I hope you like it and that you take charge of your health and make one yourself. Sitting around too long each day is never a good idea!! Thanks so much for this! I work from home and I find myself just sitting way too much. I’m ordering the materials right now. I hope you love using it as much as I do. There are some things that are a bit tricky on the treadmill, but I love it for answering emails, comments, and writing out posts- which is most of my computer time most days. I’m doing it!! Did you find that it slipped at all from the vibration of walking? I sit all day and am really tired of having a tight back and shoulders. I would love to get back to walking on my treadmill too! Win!! I haven’t had any issues with slipping, but the arms of my treadmill have a sort of rubbery coating, so that may help keep it gripped in place. In any case, the elastic ties do a good job of holding it in place. I hope it goes well for you. I find that it really does help on those days when I’m feeling the tight back and shoulders. I’ve found that I’m not good at editing photos while walking, so that sort of work I still do seated, but I love writing posts and checking email at the treadmill. Definitely! I feel so much better when I work using the treadmill desk. Super smart and just what I need. Thank you. Wow- that does look nice, but that price tag is pretty hefty, too. That’s the price for just the desk? In all honesty, though, even a hefty price tag would be worth it for me now that I see how much better I feel when I work for several of my hours on the treadmill. I think something like that would be great for an office for somebody who is doing more than just writing and social media at their desk. For me, this covers my basic needs quite inexpensively. What a simple, creative solution for something I know a lot of people think about trying! Oh no!! That is too bad. Maybe you could find another used one for a similar price or something. I’m really so happy I finally started walking while writing! I tried texting on the treadmill the other day and almost ended up smashed into the wall behind me! This would be a lifesaver! Ha- yes. I’m not very good on my phone on the treadmill. The screen is too small, so the movement makes it hard to see what I need to see, and I have to turn the speed way down. With the computer, though, I’m getting pretty good at keeping up a pretty good pace. What a cool idea! Never would have thought of that. Thanks for sharing. What a clever idea. Now if only I had a treadmill. Maybe I can figure out how to create this set up for my bike trainer. I am so clumsy so this would be interesting to see how it would work but I love the idea. I’ve never been so stationary since I’ve become a full-time professional blogger. Thanks for sharing this great DIY! Wow, this is so brilliant! What a great idea! If I ever get a treadmill, I’m going to do this! Okay, I’m glad you addressed the coordination issue. I’ve seen this idea – and thought it was brilliant – but I’m not exactly sure I can think, type, and walk all at the same time! It’s really so much easier than it sounds. I tried doing a standing desk first, and hated it! I got really bored and just wanted to sit down again. With the treadmill, though, I just want to keep going! Brilliant Tracy, you’ve done a great job. I am trying to do something similar with my exercise bike.